Local Projects, one of the earliest self-described experience design studios, is responsible for the successful facilitation of the abstract experiences of emotion, memory, and social connection. How then, does Local Projects continue to make successful design decisions while relying almost entirely on qualitative feedback? The answer, it seems, is a familiar one: it depends. I spoke with Christina Latina, Art Director at Local Projects about what goes into taking projects from ideation to their final forms. What are your major responsibilities in your position at Local Projects? I am an Art Director at Local Projects, which I often analogize to being like an Octopus. I work in a cross-disciplinary capacity across many of our departments (we have a few: Visual Experience Design, Creative Technology, Content, Strategy, Project Management and UX) to bring our work to life. From concepting and sketching ideas to media production, space build-outs and technical development, I get to work on so many aspects of our projects (hence the Octopus). What drew you to working there? I really fell in love with the work with Cooper Hewitt, The Tech Museum of Innovation and 9/11 Memorial — each of these has a depth and sensitivity to content that translates into these really embodied, relatable and meaningful moments. I was also impressed by our Principal Jake Barton and our Leadership Team’s dedication and fearlessness in exploring and incorporating new creative technologies. How do prior research and past projects inform the work that Local Projects is presently doing? Every project gives us the opportunity to refine our methodologies. What does the process of user testing look like before a prototype is reached? At Local Projects we use a methodology of ‘Prototype First’ that is crucial to the success of our ideas; so testing is fundamental to our process. We take an iterative approach to prototyping, often incorporating rounds of user testing at different stages of the prototype’s development, depending on the nature of the interaction and the design, and using those insights to evolve the work. We are productively critical of each other, democratic, transparent and encourage a strong POV with each other to push our concepts as far as we can, and our clients are a crucial part of this process as well. Local Projects is known for the emotional content and interactive elements of its work. Are there certain metrics, technologies, or methodologies used to evaluate these aspects when testing a prototype? The primary aim with our work is to create experiences that drive meaningful conversation between humans in public spaces. It’s difficult to assign metrics of success to that, as it’s often tacit, and sometimes concepts just work or they don’t. Each team spends a lot of time researching and developing concepts through sketching. Once we’ve got a solid concept in place, we can quickly evaluate the idea and our assumptions by creating lo-fi prototypes, setting them up in our studio and testing them on each other. We often are creating unconventional modes of interaction and using unconventional technology, so it’s crucial at this stage that our ideas make sense and can be built. After the initial prototyping round, we take it out into the real world and test it with real users. We create many more rounds of prototypes until we get to a conceptual and technical solution that works. While we have a toolkit of methods, each project is uniquely different and suggests different metrics and methodologies. How do these provide direction in the development of projects? Our UX team is methodical in conceiving of testing methods and documenting findings from these tests. After these qualitative and HCI type interaction evaluation methods, they take an adapted grounded theory methodology at evaluating and developing insights that inform subsequent iterations of the work. Do you have a personal preference for a certain method of measuring user emotions / engagement? Why? My favorite method (which perhaps is arguably not even a method) is when you capture photo or video documentation and see the facial expressions of test users as they engage with your prototypes and ideas. Microexpressions convey a lot, and often more than the users themselves say through words. How does Local Projects evaluate the effectiveness of a project once it has launched? With our clients we create a set of goals, objectives and requirements for the project from the outset to measure success, each unique and customized. But to me, the public’s engagement and reaction is always the strongest measure. Are there any methods of evaluating engagement that you anticipate becoming more widely used in the future? I would love to see something like an open interaction laboratory where guests can come and play out ideas, especially in different and unexpected contexts. In general, design and technology could do a better job at incorporating underrepresented viewpoints, and especially for works that live in public spaces. What is Texture, and Who Is It For? 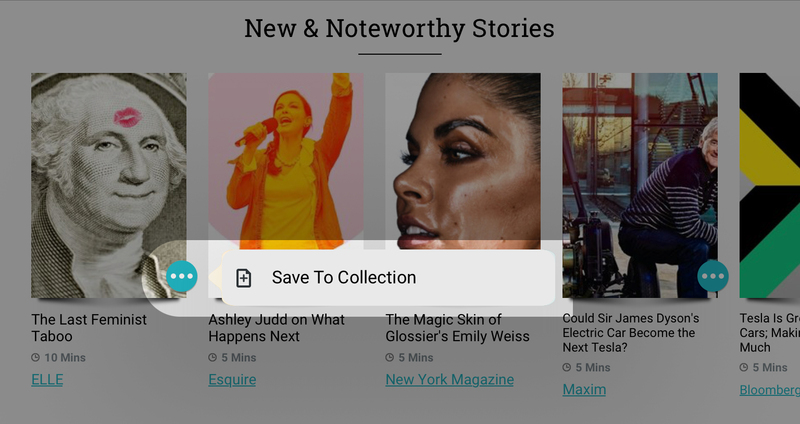 Texture is a subscription-based mobile reading app that gives its users unlimited access to a broad range of select magazine titles. It provides useful features such as offline reading, the ability to save magazine articles for later reading, and “subscription” to favorite publications. For mobile readers, Texture is space and cost effective in comparison to maintaining subscriptions to multiple physical copies of numerous magazines. Texture is available for mobile phone as well as tablets, but for the purposes of this critique, I will focus on its interface as seen on popular e-reader style digital tablets. Also omitted is the reading mode, as many magazines pre-format their e-publications differently, resulting in varied displays of content. The default landing upon opening Texture is the Highlights screen. The Highlights screen shares the same top bar for wayfinding and a bottom navigation bar with the three other screens outside of the reading mode — My Library, Categories, and Settings. The user’s location in the application is indicated in the top bar heading, as well as by the cyan color used to signify interactive elements within the content (Fig. 1). Fig. 1. Major signifiers of Texture’s various features. 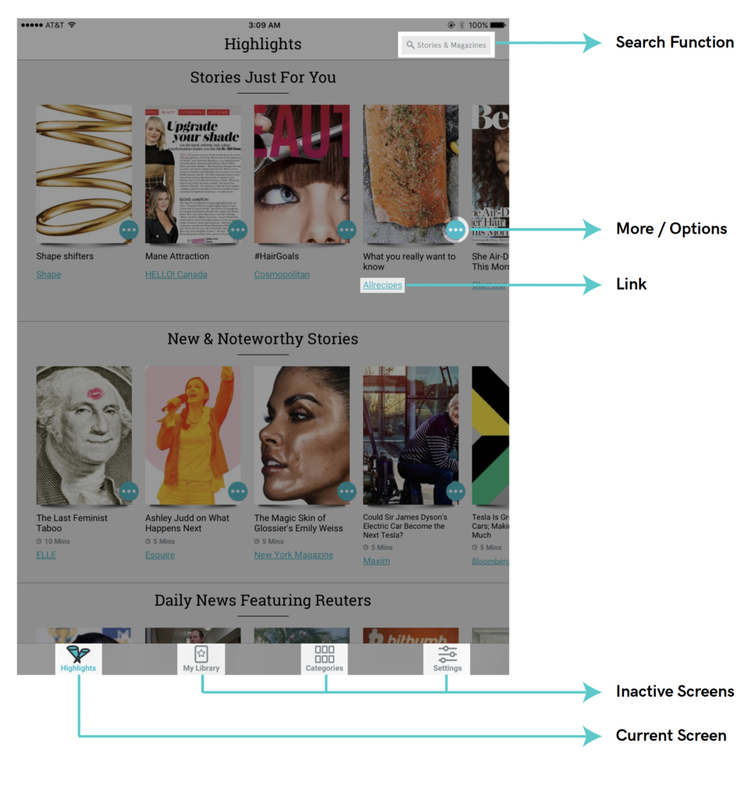 Browsing magazines is more activity than task, but the search function present in the top navigation throughout the application affords the user a path to seeking more specific information, or further information inspired by previous browsing. The shift between browsing and searching can be made easily and without interruption. Once selected, the feedback of a blinking cursor is immediate and straightforward. Although the search is a particularly useful feature, it is camouflaged in the same grey as the rest of the top navigation. Its visibility could be improved by highlighting the magnifying glass icon in the same cyan accent as many other features are cast. The More / Options icon follows the current navigation convention of the ellipsis to indicate further options. When selected, it displays possible action(s) in relationship to the thumbnail with which it corresponds (Figs. 2, 3). The natural mapping through proximity is intuitively understood. The use of the ellipsis icon (much like the use of the hamburger icon) is effective with many users, but could benefit from a text-based label to make sense to all users. Fig. 2. The “More” icon. Fig. 3. The “More” icon, when pressed, displays possible action(s). 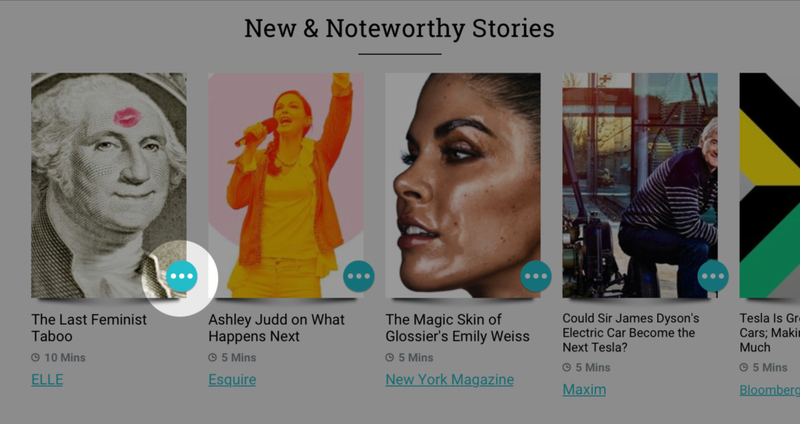 Further articles within categories such as New & Noteworthy Stories can be browsed by scrolling horizontally within the category. The use of horizontal scrolling is repeated elsewhere in Texture, most notably in the Categories screen. Horizontal scrolling solves one problem — the problem of screen space limitations — but in Texture, it also poses another. Texture’s implementation of the horizontal scrolling function is not apparently discoverable. The user can infer that scrolling horizontally is possible by noting the only partial display of some of the article thumbnails, however, this possible action should be more clearly indicated with an arrow or other symbol (Fig. 4). Fig. 4. Categories screen navigation. Also visible in Figure 4 as well as Figure 1 is the size ratio between the primary headings in the top navigation bar (which indicate the user’s current screen) and the category subheadings within the content (in fig. 4, All Magazines). Both headings are identical in size and weight, and on most screens (as in fig. 1), separated only by a thin dark line. Greater visual and spatial differentiation between headings and subheadings would improve Texture’s system image, creating a clearer hierarchy. If a user were scanning through content quickly, the building of their conceptual model is slowed by such identical formatting of differing levels of information.  Digital reading interfaces have made great advancements in usability, and Texture has skillfully maximized the use of its presumably limited screen space — it need only improve its design with some small changes that seek to service the user rather than conserve screen real estate.